LeSage Beginning: Cover the process of creating chain stitch lace with a tambour needle. With the same needle, practice embroidery with delicate beads and sequins. Incorporate basic embroidery techniques with needle and embroidery thread. LeSage Advanced: Learn the techniques necessary to create your own haute couture details. Lesage is France’s oldest embroidery house, it has a detailed history of fashion over the past 150 years. Started by Albert Michonet, embroiderer to Napoleon III as well as Paris couture pioneers Madeleine Vionnet and Charles Worth. 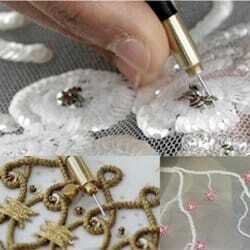 tambour embroidery is embroidery done with a tiny hook. It’s normally associated with bead (and sequin) embroidery. 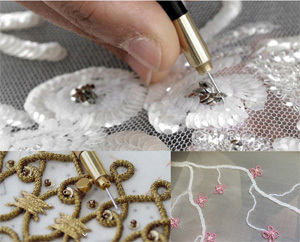 Design houses such as Chanel and Yves Saint Laurent use this method to create their delicate beaded garments. Don't forget your 20% student discount at PFI Supply store.